The Chief Minister thanked the Vice-President for his guidance during his tenure as Union Minister in helping Pasighat achieve the status of Smart City. 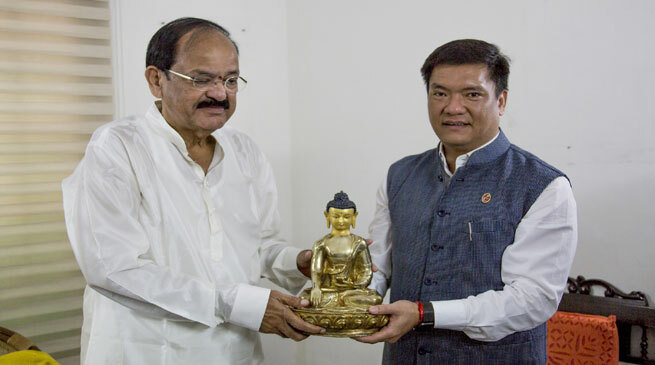 He also thanked Naidu for his cooperation to consider the state government’s request to get Itanagar under the Smart City Mission, informing that it is the only state capital in Northeast that has been left out. He thanked the Vice-President in fulfilling the wishes of the people to get the Film and TV Institute in Arunachal functional. Also the Chief Minister thanked him for a dedicated Doordarshan channel – ArunPrabha, which will showcase the rich culture of the Northeast to the rest of the country. The Chief Minister expressed delight working under PM Narendra Modi, who have been conducting review meeting of CM from BJP ruled states every 2 months where they are to give presentation on their performance. Naidu advised the Chief Minister to continue working with the dedication he has for the people and to set examples for other leaders to follow. He expressed his keen interest to visit Arunachal during the launch of DD Channel – ArunPrabha.